Fresh is not a bad thing between friends, Thelma. I’m as anxious as you for another Tall book. Stay tuned. Very entertaining interview! 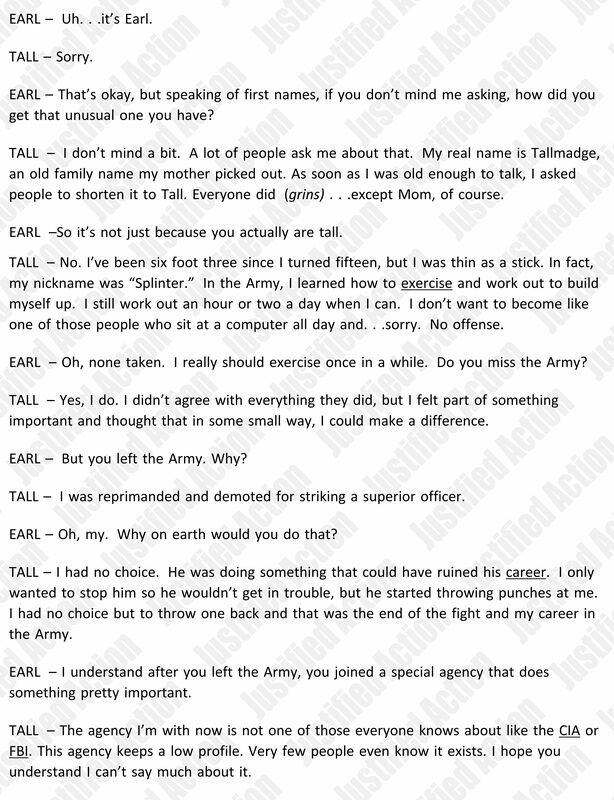 Got to know Tall a little, and yet there was some humor in it. Thanks, Earl! Glad you enjoyed it, Marja. A little humor never hurts anything, does it? Don’t worry, Madeline. I stayed indoors until I was sure it was over. Besides, there wasn’t much left out there after Tall and his crew finished. They don’t mess around. 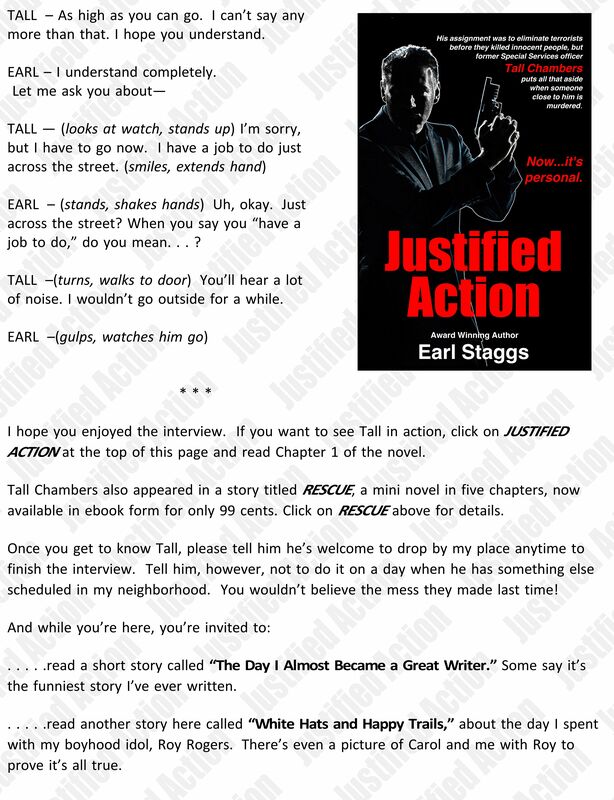 Love character interviews, Earl. Good to learn more about Tall. I hope his job across the street didn’t mess up your writing day. I have to admit, John, all that noise was distracting, but we writers must muddle through no matter what, don’t we? Thanks for stopping by. Dang, I thought I left a comment a little earlier. You don’t suppose I said something to upset Tall do you ! You could never upset Tall, Kaye. He’s over the moon crazy about you. Unfortunately, some early comments disappeared. Cyber gremlins at work. 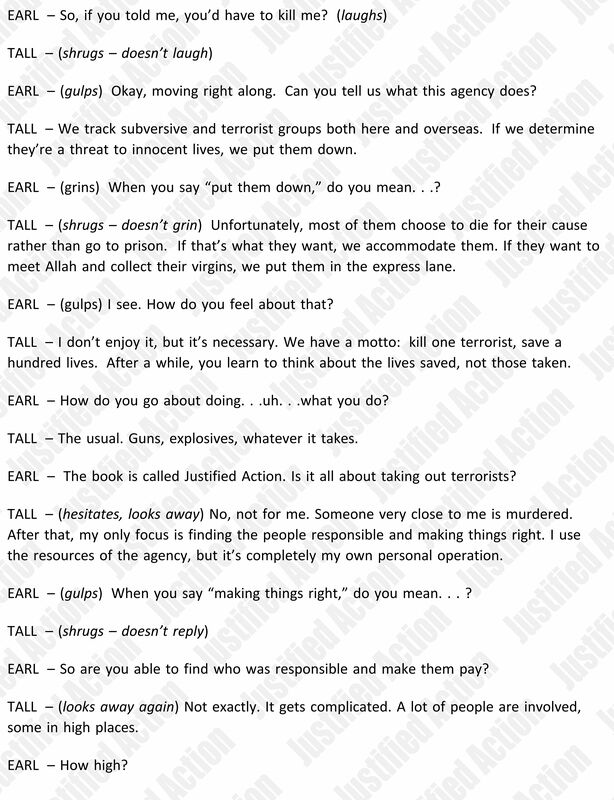 Great interview, Earl. He sounds like quite a hunk! Next time, could you do a TV interview with him? The ladies would LOVE that! A TV interview? Great idea, Pat. I’ll let you know when we set it up. If I look bulky on the screen, it’ll be because I’ll be wearing a bullet proof vest. Glad you enjoyed it, Terry. It was fun to do. Thanks for dropping in and best wishes to you. 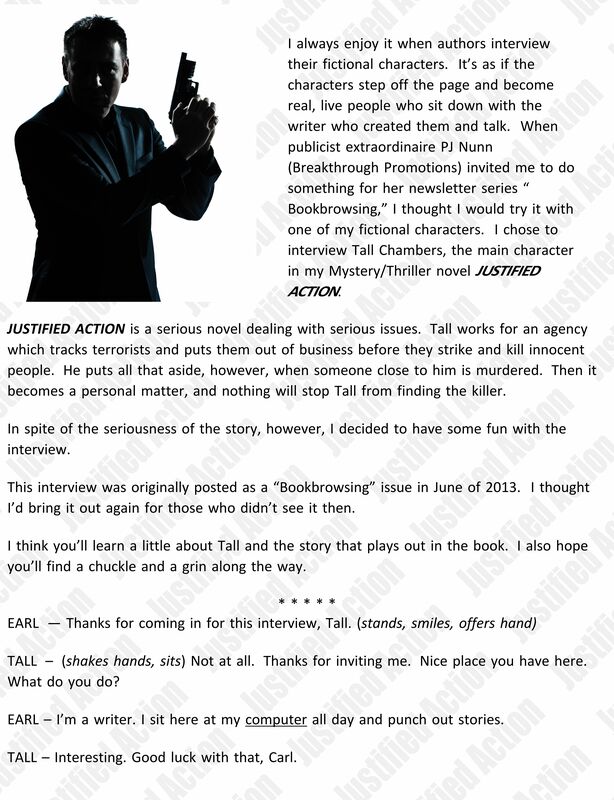 Great interview, Earl. You must be very thirsty after all that gulping! Keep the words flowing, and the fun! Hey, Ant Jan! Hanging out with Tall can leave you dry-mouthed, that’s for sure. Another thing for sure is if we don’t have some fun along the way, this writing thing is all work. So let’s keep the words and the fun flowing. I, too, love it when characters interact with “us”. Thanks for the interview and sharing your work. The way I see it, Crow, if we don’t think of our characters as real people, we’re not doing it right. Thanks for stopping by. This sounds like a fantastic series. Well done! Thanks for dropping by and for your comment. Best wishes and good reading to you. Swell stuff, Earl. Plenty of pep and pizazz. Can I suggest you include such as a bonus in your next work? Or perhaps noted as a link to the web page? Thanks for visiting, Ben, and thanks for the suggestions. I just read your Pandereos Ajax story on KRL and enjoyed it. Best wishes for continued success with your writing. Thanks for the hat tip, Earl. It’s awfully generous when established authors take time out for unknowns. Thanks for making the sandbox bigger. Earl: somebody has hacked your website and your email. Got a really weird email stating you were in Manila with no money. sigh…. Either of us will do, but Tall is much more interesting than that silly interviewer. Thanks for coming by! Dear mmcewenasker. Did you have a question or need information?